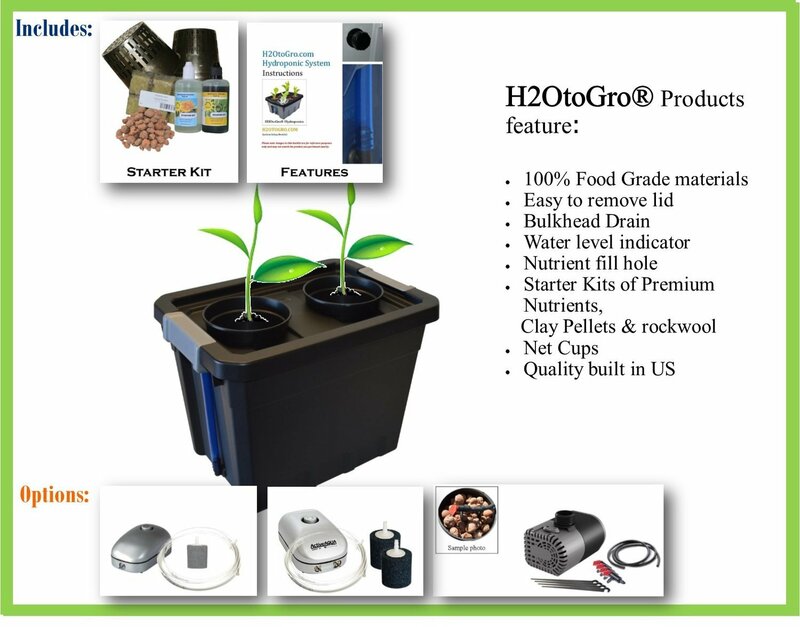 All H2OtoGro® hydroponic systems are manufactured using 100% Food Grade materials, "Blackout" style, customized reservoirs and lids. Our "Complete Kits" include STARTER PACKS with enough clay pellets and rockwool squares to start your first set of plants plus two weeks of premium nutrients. Newly redesigned sealed drain system: grommets have been replaced with our Exclusive H2OtoGro® drain that features a water-tight and secure bulkhead assembly and garden hose connection. Makes system changes much easier and eliminates the need to move systems while still full of water. Optional shut-off valve can be added if desired. Exclusive H2OtoGro® blue tube water level indicator. The color reduces algae growth. Deep Water Culture ~ the roots are suspended in the reservoir beneath the net pots, where they bathe in nutrient-rich solution throughout the entire grow cycle. Hydroponics increases the plant yield and reduces grow time. This Kit Includes: Custom "blackout style" reservoir with custom lid, your choice of size and quantity of net cups, STARTER PACK of clay pellets, rockwool squares and two-week supply of premium nutrients. Commitment to our customers – Our customers are number one. We strive for 100% satisfaction. We are growers ourselves and strive for the best quality for the best results.